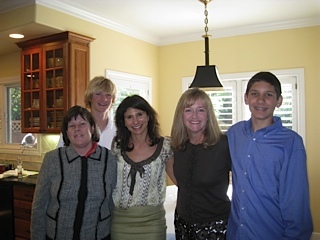 Annie (middle) with friends and oldest son, Jack (far right), in the United States. I am sitting at a familiar table in a house I have visited countless times, but I cannot help but feel a little out of place. As Annie Waldsmith, a longtime family friend, tells me of her familyâ€™s escape from violence and civil war in Lebanon I transport back to a time in her past that is more than what my high school mind is ready for. I hear the rest of her story and her eventual path to the United States. I am shocked. It feels as if I am meeting her for the first time. Yet in this first hearing I was just touching the surface, privy only to an outline. It was not until I spoke with Annie a second time about her journey, for this story, and drew more vividly the details from her memory that I began to understand the true power of her experiences. It is now three years later, as she relives over the phone the two years before her family finally made it to the United States. She returned to Lebanon to see a beaten country. The balcony of her house that had been blown off by bombs, she says, was the only memory left from her old Beirut home. She transports me back to the shaking apartment complexes where, at the age of 10, she had refused to hide in the basement. Her family made the decision to flee Lebanon, but each time they tried to leave from the airport, it was bombed, leaving Annie with the memory of 48 hours spent hiding in terror under an airport desk. But because her father worked for the airline company, he was able to get them a charter flight out of Syria. He procured papers enabling them to take on the persona of whomever worked – a Muslim, a Lebanese Christian or any other identity – to pass through checkpoints guarded by teenagers with AK-47s on the way out of the country. With only an overnight bag each and $1500 total, the Mishirky family pinballed from Syria to Athens and finally to London before deciding that the United States would be the most financially secure location. On a whim, her father chose San Francisco as the final destination, Annie says, simply because he heard it was beautiful. Making the transition and assimilating was relatively easy, she adds, because Annie and her sister had been educated in British schools and spoke English flawlessly. As her family built a new life in the United States, she tried to put Lebanon behind her. Decades after making the initial move to the United States, Annie is proud of her cultural heritage and recognizes how important that journey was. In recent years, she says, she has even come to peace with what happened and would like to take her kids back to Lebanon one day. As I hang up the phone I am filled with a sense of awe. After our first conversation three years ago I got names, places and travel details, but I missed the true power of the story. There are so many things in my life I take for granted, and hearing Annieâ€™s perspective makes me appreciate those things and people so much more. What Annie went through could have left anyone bitter and jaded, but her willingness to come to peace with the past makes me realize that no fight in my life will ever be worth holding a grudge over.